A week ago Stelvio Cipriani passed away. 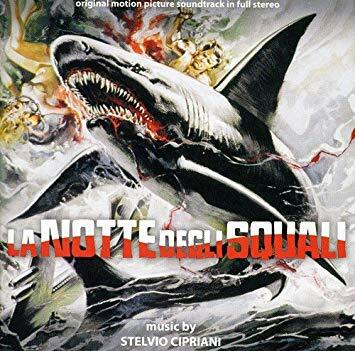 He's been the composer of a couple of our Soundtracks of the Week in the past and now we'll do another of his for our 538th: La Notte degli squali. The cover made me think that this was a Jaws rip off, but it's from 1988, which is kind of late in the day for that sort of thing. Reading the plot description on Wikipedia makes me think that it's kind of all over the place. It has a very low rating on imdb but I would probably watch it. The score is very synth-heavy and pounding. The main title theme has a late-Goblin feel. Cipriani juggles different rhythms and atmospheres with ease and cruises in and out of different melodic and harmonic ideas. "Cacciatore di squali" is a good example of how well he can navigate different kinds of dramatic terrain in just a few minutes. Some of the other cues, such as "Bandidos", are agreeably similar to the music for Miami Vice, which was perhaps a conscious choice considering the popularity of both the show and its music at the time. There's even something that sounds like a love theme, "David liz", with the melody taken up by trumpet. You hear it again in "Notturno d'amore", with the melody on synth this time. It all sounds like it would be very effective in a movie and it's also very rewarding to listen to.